Thanks for your advice regards my project, see below. 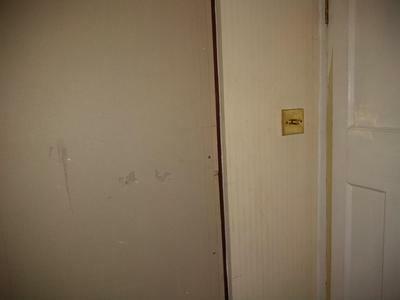 How can i skim up to a sharp corner without a crack appearing alter on? I attach a photo of the gap and sidewall. That actually makes it easier to join to as you have a definite edge to work to. The plaster will stick especially if you apply diluted PVA to the small area that you are plastering up to. It will only crack if there is movement or the old wooden frame is not properly prepared as previously discussed. The patching/joining page and video in skimming expalains the procedure. But rest assured, it is good to have a definite edge to work to and if plaster is pushed in firmly and the exposed wood is covered there should be no cracking if there is no movement. 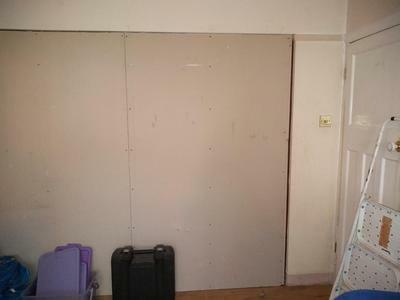 I was nearly ready to go when I realised that the plasterboard to infill my double doors has tapered edges! and so where it meets the plastered sidewalls (and where the two p/board sheets meet in the middle of the doorway) there is a gradual but definite dip of about 1-2mm . As you recommended to use bonding to fill the gap between the plasterboard and sidewalls would it be okay to level this area out with bonding as well? Thanks for your advice and your colleague, I'm nearly ready to go. One thing I noticed when stripping the wallpaper back from one of the side walls is that it has not been plastered flat where it meets some boxing in. As it is only a narrow with of about 4 inches of wall and it gradually gets level as it meets the picture rail I think I can get away with it! ?